Sacred Blessings To You & Yours And Welcome To The Home Of The Flying Eagle Medicine Tribe - Sacred Shaman Oracle - 28 Day Guided Soul Retrieval Vision Quest. Building Social Networks & Empowering Universal Connection - This site is a 100% free, Flying Eagle Medicine, shamanic energy resource. 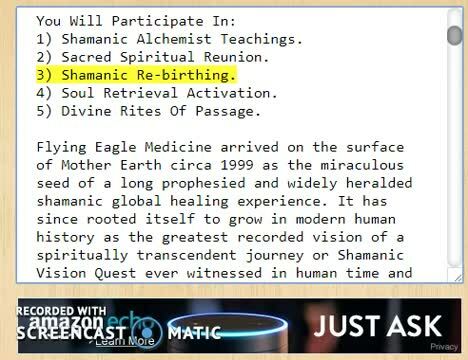 To Begin The 100% Free, uniquely personal, Sacred Shaman Oracle - Flying Eagle Medicine - 28 Day - Guided Soul Retrieval Vision Quest, follow this Begin Vision Quest Link now to download the guidebook pictured above. Here is something Completely New for the 2020 21st anniversary of the Sacred Shaman Oracle's arrival on Mother Earth celebrations. 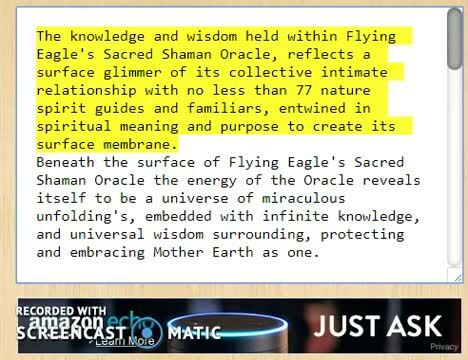 Its called The Sacred Shaman Oracle - Flying Eagle Medicine - Global Healing Circle. Here you will have 24/7 access to like minded healers in search of the deepest universal spiritual truth and experienced Flying Eagle Medicine Mentors who can help you achieve your full potential on the 28 day vision quest. Please Join the group after you download your guidebook. This site is a free open access, Flying Eagle Medicine, online resource. If Flying Eagle Medicine helps you in any way, please help share the love. The World of #FlyingEagleMedicine ... Recommended Reading on Evolving Enlightenment for all practitioners, students and potential future shamanic initiates on the Flying Eagle Medicine pathway. The world humanity experienced in the 1800's changed so rapidly in the 1900's that a 2020 visitor to earth will not have the same experience of living on earth as all of the visitors to earth pre 1800's did. When change occurs adjustment needs to happen - it is a natural requirement of all life on earth. How the evolving dynamic of communication and the natural human spiritual experience of life on earth has changed is the core subject in adjusting community understanding and developing 'community respect' for the appearance of Flying Eagle Medicine on earth. The cyber space environment of social media and global communication via the internet has changed the experience of life on earth forever. And it is here to stay! If you were born into an earth environment without the internet it is okay to not want that change to be real - but that is... from now forward - an irrational view point because all of earths children born into the world post 2020 will never experience life without the man made cyber space environment as a core aspect of their life. 1900 to 2020 .... Radio has made way for Pod Casts, Silent movies made way for talkies and Cinema made way for YouTube. Motor vehicles made way for space travel and face to face communication has made way for endless social media platforms that have removed all borders and boundaries of separation and distance between people to bring people together as a Global Village in cyber space and that is the life humanity has naturally evolved into as a collective whole. Like it, hate it or have no thought about at all, that is the reality of human life on earth post 2020. Social media has become a rite of passage for life on earth and visitors to earth from here forward will experience one kind of cyber space communication or another as a very normal and almost natural part of their man made reality in life exactly as they will being toilet trained and sitting on a toilet. Flying Eagle Medicine is the spiritually ordained collective Global Shamanic response in reflection of human evolution in their natural relationship with wanting and needing to know themselves as a consciously connected part of the universal-self-conscious whole. In total, the cyber space environment has come into being because of mankind's deep longing to know itself as part of the universal whole and the search for answers to life biggest questions through the exploration of outer space. Shamanism has always reflected the natural search for the deepest possible knowing of the 'self' as part of the universal whole in ways that might appear different than today. Looks can be very deceiving! The way Shamanism has looked through history is not relevant to the way Shamanism will look in the future world of a global village dominated by cyber space and social media. What is relevant to the Shamanic Enlightenment experience is the FELT EXPERIENCE and SENSATION of Shamanism - the sensation of awakening the knowledge base of core Shamanism in the conscious mind - the felt sensation of being part of the universal whole in a natural collective experience - the felt personal relationship with spirit guides and familiars - the felt sensation of connection to super-consciousness - the feeling of an awakening dream being recognised and the sensations aligned with fulfilling that dream. Flying Eagle Medicine is no less reflective of the human spiritual evolution of Shamanism than than rock art is reflective of human communication evolution in the world of cyber space and social media. The experience of Flying Eagle's teachings and the Flying Eagle Medicine found in the Sacred Shaman Oracle is as relevant in every way, as every Shamanic initiation that has ever occurred on earth in time and space. Yet it occurs in your private space, in your home, because of a global connection you can experience through cyber space. Mankind has evolved to the point where the maximum possible number of people on earth, now and into extended future, can experience their life as being part of the universal-self-conscious whole through Flying Eagle Medicine via the intimate personal and private connection cyber space and social media provides them. That is an extraordinary outcome for the conscious mind of the global collective to witness, celebrate and honour as part of the universal-self-conscious whole. #FlyingEagleMedicine for initiates, students and practitioners. Why is Plant Medicine initiation a NON requirement of Flying Eagle Medicine to achieve the heightened level of conscious awareness associated with Core Shamanism? Plant medicines that enact an energetic state of awakening to universal-self-conscious have become synonymous with the term Shamanism since the heady days of the Harvard experiments with psilocybin [magic mushrooms] and since being the subject of Californication and Hollywood hype reflected in the 1980's movie Altered States. The word Shaman has a common ancestor in every language base on earth because the common experience of Shamanism [Original Animism] is core in every culture on earth. The word Shaman being used in modern English language as a descriptive for a spiritual view point is the outcome of human global evolution and reflects a global position of spiritual knowing, understanding and personal experience that is relevant to universal-self-consciousness not relevant to the use of Plant Medicine. Plant Medicine will not evolve the initiate to the highest point of self-knowing or the pinnacle experience of Shamanic knowing because it is a physical substance not the stream of universal-self-consciousness or universal life force energy that Core Shamanism is authentically focused on. At best Plant Medicine is an opening or a doorway in for ancient cultures that did not record or transcribe the core quantum universal information of Shamanism in a mind based initiation and immersion ceremony and cannot be described as the complete Shamanic whole. The Chinese word universal life force energy is Qi or [Chi] and is part of the energy medicine practice of the traditional Chinese or Asian culture. In Chinese history the ways of awakening to this energy have been many fold. Carl Jung, an historical Shamanic global figure head focused on the advance of Psychotherapy as an awakening tool, made use of the Qi energy medicine found in the Chinese I Ching Oracle, in his spiritual-self-development work from as early as 20 years old. Another notable separation from any reliance on Plant Medicine to achieve the highest levels of Shamanic consciousness possible in human form is the relationship of Shamanic Legend Odin and the spiritual energy medicine he found in the Runic Oracle. Plant Medicine has not been a key component of the historical Shamanic lineage on Mother Earth until Californication and Hollywood made it so.